Story: Michael Weismann was an ordinary man with an extraordinary ability. Born of a family of police officers and civil servants, Michael believed in the law and the responsibilities that fell under those who wear the shield. When his powers manifested, Michael took a cue from the police hero called E.S.C.O. and became the second Superhuman to become a member of the Powers Division, the S.W.A.T. equivalent to superhuman encounters in law enforcement. When E.S.C.O. left the Powers Division and turned in his badge when the Frontline, the primary super team of Chicago, went to war with the Archangel Corporation, The Chicago Police Department looked to Michael to become the “premier” hero to fill the vacuum left in Frontlines’ wake. With the backing of the city and the police, Michael developed the Samaritan persona and recruiting several other individuals, formed the team, the Second City Armada. With the Armada, The Samaritan made an impact by busting gangs on the South Side and the Logan Square areas. Then, the Armada routed illegal arms and drug deals around the former Industrial and Warehouse sectors of Chicago. Occasionally, the Armada fought with several of the city’s own villains’, like Jagan and Sliver, and occasionally faced off against one of the team’s rogues like The Renegade or The Pulse. But Michael felt something lacking in the team’s endeavors, sparked more so by the comparisons of his team to the Frontline, which has drawn unfavorable reviews of his team. He decided that the team needed a challenge to prove to the city that the Armada is a worthy successor to the Frontline. That challenge came in the form of the powerhouse fugitive, Crimson. The Samaritan gathered Intel on Crimson’s whereabouts and prepared his team to face him at the city limits. Confident in his battle with the mystical juggernaut, The Samaritan launched a press conference announcing his team will go off and halt Crimson’s march and invited the media to observe it via helicopter. Unfortunately, things took a turn for the worse for our Michael and his team. At the City limits, The Second City Armada established a barricade around the vicinity and stood at the front, ready to face off against Crimson. When the rogue goliath came forth, the Armada leapt into action, with The Kamen Brawler being the first to fall as his torso explodes from Crimson’s fist. Tempest gets swatted several counties away, shattering every bone in his body. The Samaritan, shocked by two members falling, still pressed his attack and for a while, seemed to gain the upper hand. That is, until Crimson powered up. He delivered a devastating right hook that made the Samaritan actually feel his ribs and jaw crack from the impact. His team mates, Battalion and Ryuji, provided range support to give the Samaritan time to recover. Battalion took action and charged at Crimson with a battering ram construct, only to have it shatter and Crimson slamming him down hard to ground, and was about to stomp him, when The Ryuji flash froze Crimson in place, giving the Samaritan the chance to uppercut him into the Stratosphere. As Crimson is propelled skyward, The Samaritan flies up and continues his assault, only for Crimson slamming The Samaritan down hard into the ground. Crimson lands on top of the Samaritan and proceeds to pummel him repeatedly, blacking out. When Michael awakens, he sees Ryuji down on his knees, clutching what remains of him left arm. Enraged, Michael charges and delivers blow after blow after blow to Crimson. Then, in a last stand, both The Samaritan and Crimson engaged in a brutal back and forth, exchanging devastating punch after devastating punch, with each of Crimson’s blows slowly killing Michael, he wouldn’t give up. Finally, when he couldn’t take much more, the Samaritan collapses to his knees and Crimson, crushes the Samaritan’s head. The Samaritan is dead. Crimson is shortly defeated by the returning Frontline, who also rally to get the Second City Armada memorialized for their actions. Michael died a hero and the city will remember him as long as his and his team’s memorial stands in Millennium Park. Abilities: The Samaritan possesses super strength, flight and invulnerability. With Strength, the Samaritan is capable of lifting a maximum of ten tons and capable of bending steel and crushing stones. The Samaritan is capable of flying at speeds up to Mach 2. His invulnerability makes him resistant to a majority of weapons fire, acids, and burns. The Samaritan wears custom made body armor composed of metal and ceramic plates and a bodysuit of Kevlar weave. 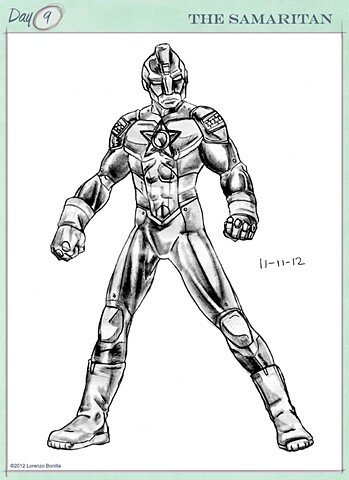 Unlike E.S.C.O., The Samaritan developed his suit to be more heroic than resembling the police, while having an oversized police star serve as his emblem and connection to the police. The Samaritan is skilled in self defense and hand-to-hand combat as per regulation from the Chicago Police Department and advanced training from S.W.A.T. As such, the Samaritan is proficient in handling both small arms to assault weapons. Conception: From a stockpile of blank character slates awaiting development, I developed the Samaritan based on the premise of using a hero to take over another prominent character with a general enough power set that should it get killed off, it will be forgettable and able to resonate for a story arc. His arc serves as a cautionary tale of taking on more than you can handle, while showing the noble sacrifice that all heroes eventually have to do for the good of those that they vow to protect.